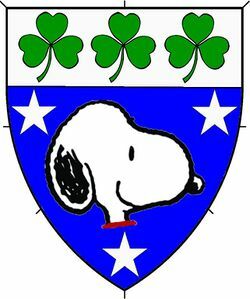 'Azure, a dog's head couped contourny between three mullets and on a chief argent three shamrocks vert. Bantiarna Shannon inghean Bhriain uí Dhuilleáin, pleased to meet you! My very first event was NRWC in July 2000, after which I promptly lost track of the SCA for nearly four years. I rediscovered it after I was discharged from the Army in the Barony of Western Seas, Caid (Hawaii). I have since lived and played in four kingdoms (Caid, Atlantia, West and East). I am a member of House Rosegate and protege to Mistress Arianna Morgan (Atlantia). My listing in the East Kingdom OP isn't yet updated--I've just moved back from Atlantia! In the meantime, you can see an updated listing here. Unto all nobles and gentles to whom these present letters come, greetings! Tis I, Bantiarna Shannon inghaen Bhriain ui Dhuilleain. I am a young noblewoman of fifteenth century Ireland. My father, Tiarna Bhrian O Dhuilleain, heads a small, prosperous household with my mother, Bantiarna Anlaith ingen Taidc, in the earldom of Kildare. The youngest of their seven children and the only girl, I was born on the seventeenth day of May in the year 1460. My father, a free man, was quite loyal to Thomas Fitzgerald Earl Kildare, who became Lord Deputy Thomas when I was eleven years of age. As a girl, I loved to ride the horses of the estate across the rolling green fields. I received a noble's education growing up - I am literate, and I can speak English in addition to my own native Gaelic. In addition, I learned many things a woman is supposed to know - sewing and embroidery, knitting, and cooking, running a household. Most of these lessons seemed superfluous to me, since the house was always abuzz with servants doing all but the last of these very tasks for us. Lord Deputy Thomas' son Garret was only a few years my senior, and I fancied him greatly, despite knowledge that if he did marry, it would be for the good of the land and the advancement of his clan - neither of which he would achieve by choosing me. By the time Garret took his father's place, I was seventeen years old and I had all but forgotten my infatuation with him, as I had fallen head-over-heels for a mysterious fellow of eastern lineage who sporadically passed in and out of my life as his travels and my own caused us to cross paths many a time. This displeased my father, who wanted nothing more than to see me settled down and married to a good Irishman. Shannon of All Trades: A record of my A&S projects. Fifty States of the SCA: A personal challenge in celebration of A.S. L to attend an event in each of the fifty states, with an emphasis on forming friendships, studying inter-kingdom anthropology, and gifting largesse. Device. Azure, a dog's head couped contourny between three mullets and on a chief argent three shamrocks vert. Personal Badge. 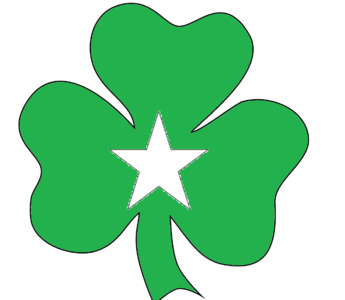 (Fieldless) On a shamrock vert a mullet argent. Quest Badge. 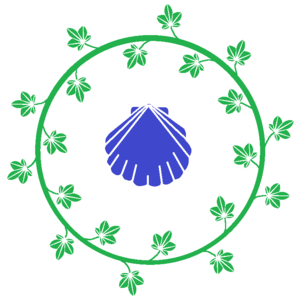 Argent, an escallop azure within a chaplet of ivy vert. I added this section because I have moved from kingdom to kingdom, and no one kingdom's OP has a complete record of the awards I have received.